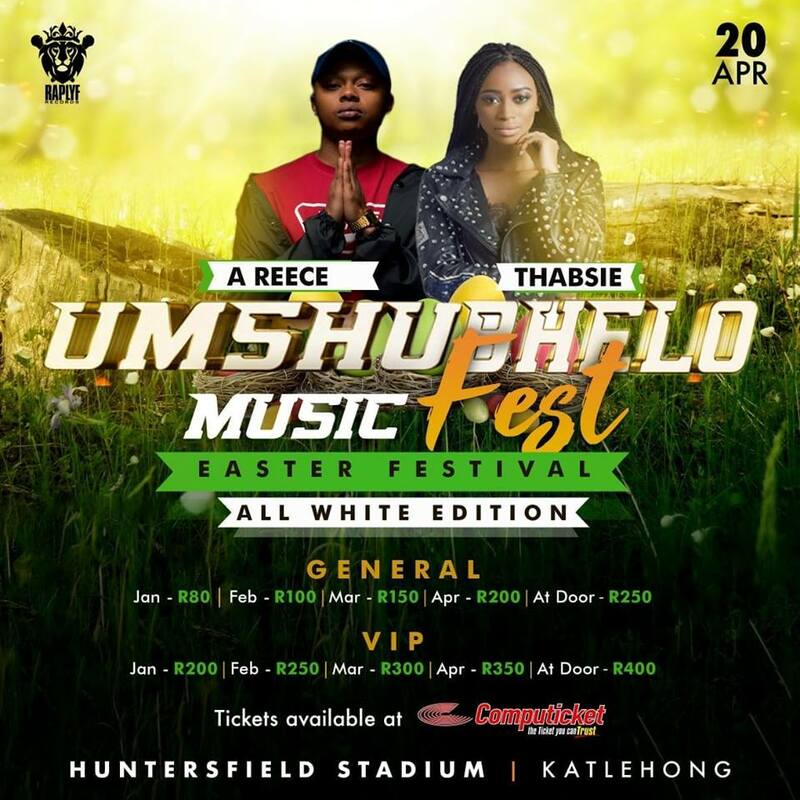 A-Reece and Thabsie will be performing at the Umshubhelo Fest in Katlehong in April 2019 alongside the likes of DJ Speedsta, Major League DJz, Simmy, Sho Madjozi and DJ Tira. Raplyf Records co-owner Kwesta announced in a Facebook post on Wednesday, 6 February 2019 that A-Reece and Thabsie would be performing at the Umshubhelo Fest in April 2019. The two musicians are the ninth pair of artists to be announced as performers for the event. Kwesta has been announcing the names of performers in pairs since he announced Prince Kaybee and Busiswa as performers on Monday, 21 January 2019. This is the fourth edition of the Umshubhelo Fest which brings together some of the country’s best musical talent on one stage. The third edition of the Umshubhelo Fest was hosted on the Day of Reconciliation in December 2018. The event is organised by Kwesta and Kid X’s Raplyf Records and this edition is in celebration of the Easter holiday. The event will take place at the Huntersfield Stadium in Katlehong on Saturday, 20 April 2019. Festival goers will be treated to performances by the likes of Cassper Nyovest, AKA, Riky Rick, DJ Shimza, Mobi Dixon, Major League DJz, Simmy, Sho Madjozi, DJ Tira and Dladla Mshunqisi. The newest additions to the line-up A-Reece and Thabsie are both rising stars in the South African music industry. A-Reece released his latest EP And I’m Only 21 in October 2018. The five-track offering is supported by the single Holding Hands. Fellow artist Thabsie released her brand new single Finally on Friday, 08 February 2019 following the 2017 release of her debut album Songs About You. Tickets are being sold in five different phases. The second phase of ticket sales is underway this month, February 2019. Tickets are available for purchase on Computicket, retailing between R200 and R250.